Flapped, Turned and Gusset'd!--Well almost gussetted—there are still a few decreaese to be done, but I've turned the corner on the socks, and now it's swift race down to the toe. Once the heel is complete, I feel as if the sock is almost done. I know in reality, that my foot is almost as long as I like my cuff, (and there fore, almost as many stitches are required—but not quite. The turning and gusset part of the heel do make up about 2 inches of the foot, and the toe shaping another inch, inch and half.. so the foot is just 6 inches of plain knitting. (vs 9 inches of rarely plain knitting in the cuff & leg)--But also, once the heel has been turned, it begins to look like a sock, (or rather, socks) and I just want to see them done! It's a very simple heel—the classic flap of heel stitch, a half round turning, and a simple side gusset. 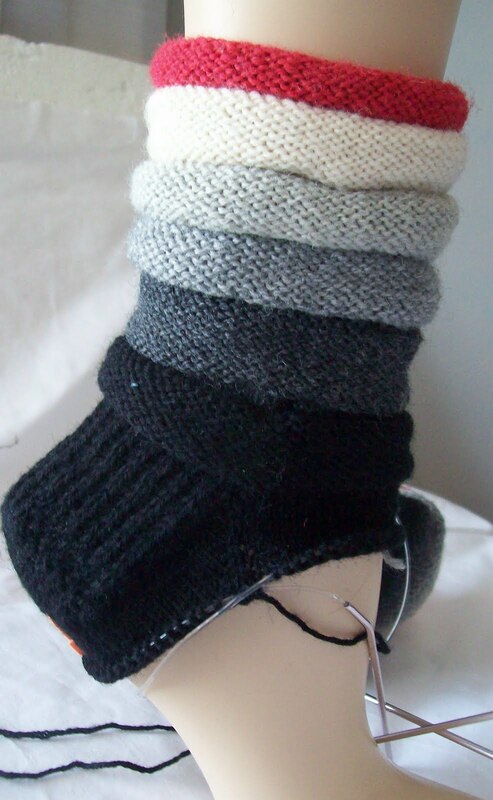 The foot is just stocking knit--the kind of sock knitting that takes very little attention. Already, I am thinking about my next pair—And even though theses sock are (cuff and leg wise) more grey than any other color, I think the next pair is going to be grey, too. Tentively, they are going to be Garnets in the Granite—done with a near solid grey sock wool (10% in the blend) —with red beading studding the work, as veins of garnets do, in granite. It's been a while since I've done a reverse shapped gusset—maybe it's time again—or maybe something completely different! The nearly completed puffy socks reminds me—I have some red fabric that is destined to become a skirt--(and some brown, and some brick, and a piece of plum-ish sort of purple) I have various socks to match all these fabrics (and when the Puffy socks are completed,, another pair to match!) I have things to do! I better get to work! How fun! Love the look. I usually knit toe up, so I always think of the heel as the halfway point or 60% once I turn the heel. You have so much going on! I bow to your productivity. So far looks very nice, congratulations and keep working.